Her eyes were the color of a vidscreen, tuned to a dead channel. Countering your opponents' moves is an integral part of Netrunner, and one which is slightly harder for the Corporations. The Runner will have tools to disrupt the Corp in any number of ways; raising rez costs, trashing assets, milling cards, etc. By their nature as an attacking force, any time they attack you they are disrupting your plan. Cerebral Static is a card that many people look at and say 'It doesn't affect Andy, The Prof or Val, so it's a situational counter'. Technically true, but also very wrong. Against those three, yes, it's rubbish. Against everyone else in the game it is usable. It is also not dependent on game state, as with the exception of those three identities, Cerebral Static affects a card that is always in play and active. Its effects are widely variable; at its worst it does literally nothing, but at its best, against Kit or Noise, it undercuts their entire deckbuilding effort. Against the vast majority of Runners it acts as a tax, costing them credits in several cases, or removing tools that they would otherwise use against you. Tl;dr: Cerebral Static affects the game against almost every runner for almost every conceivable board state. It is really worth taking for a spin. With this card, you are absolutely crippling about 90% of now and future Runners. If this isn't worth the shot, I don't know what is. Ladies and Gentlemen, hats off for a single most awesome reference in a flavor text ever. Apex: Invasive Predator cannot install non-virtual resources, but there's nothing preventing it from including them in the deck. So the trick is this: Keep some high impact resources like Aesop's Pawnshop, Kati Jones, Political Operative, Symmetrical Visage, Personal Workshop or Wyldside in your grip and wait for the opponent to play Cerebral Static, as soon as they do you install all your non-virtual resources. You can also install resources like Same Old Thing, Daily Casts or Scrubber. Now this kind of combo is by no means realistic or even reasonable - but if you manage to achieve it the look on your opponent's face will make it all worthwhile. 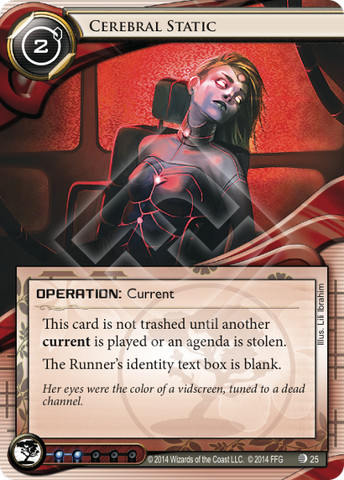 The flavor text on this card is a reference to the opening lines of William Gibson's novel "Neuromancer," which is perhaps the first great cyberpunk book: "The sky above the port was the color of television, tuned to a dead channel." Netrunner is full of little references to Gibson: William Gibson also popularized the term ICE, and a major character in Neuromancer was named Armitage (Armitage Codebusting). When you splash this it's likely against a bitter series of losses to someone in your local meta. I've found that it actually gives my Weyland space ice deck a fighting chance against Leela and Quetzal.